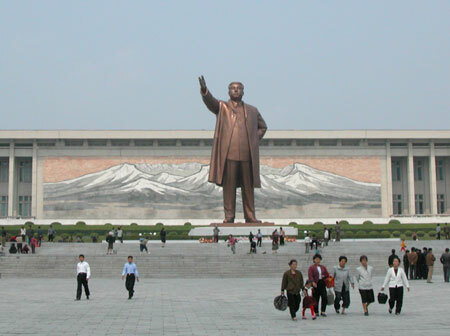 North Korea (DPRK) - Pyongyang: The monument to the Korean Workers Party, The monument to Kim Ir Sen, Learning Palace, Arts Theatre, Buddhist temple. They are on their way, as I promised. Though I must note that, the Pioneers Palace for instance was not intended for the leaders and isn't used by the leaders. And the beautiful wide streets are walked by ordinary people as well. 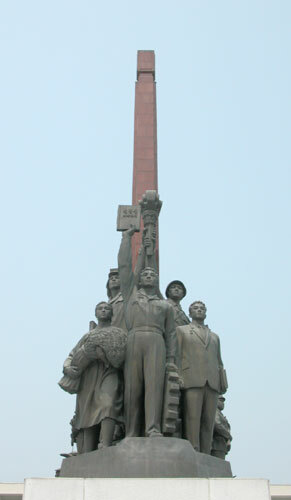 This is the monument to the founding of the Korean Workers Party. 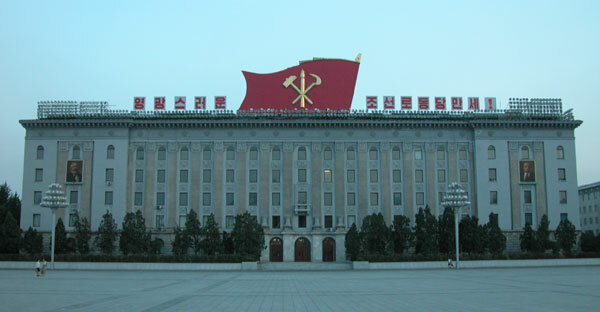 The hammer and sickle, as with ours symbolize workers and peasants. In the middle is a brush symbolizing intellectuals. 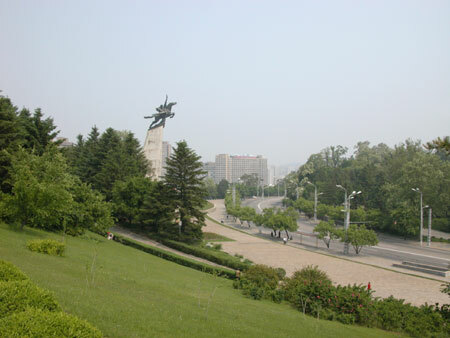 The view from the monument to the street. By the way this is a very pleasant place. Unfortunately the photo doesn't do it justice. In the distance we can see the Rangan hotel shaped like a giant (105 floors, 330 meters, 3000 rooms) pyramid. 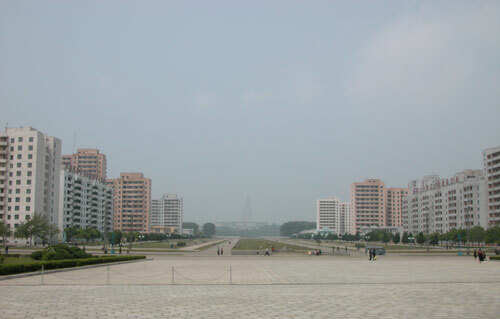 It is the tallest building in Pyongyang. Only the TV tower is taller (which looks somewhat like the Ostankino tower, we must have contributed to it). The hotel is not finished - there is a crane on top of it. Considering that it's been in such a state since 1991 (construction began in 1987), there must have been some kind of unexpected difficulties. Other construction has continued since 1991. With regards to the trains, they were recognized by an acquaintance of mine as having been made in Czechoslovakia. Trains of this model used to run in Voronej, where he lived. 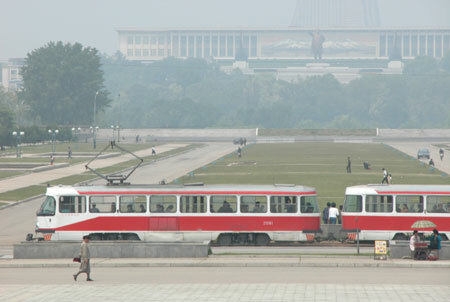 Besides the trains, there are buses and trolleys. I think they are mostly Japanese made. I saw an Ikarus a couple of times, but it is more of an exception. During rush hour the transit is extremely crowded. 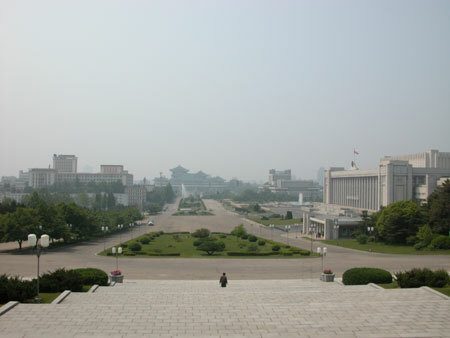 Further in the haze we can see the monument to Kim Ir Sen on the Mansu hill. That's where we are headed. This is the country's main monument. The Pecktu Mountain is in the background (the mosaic is about 70 by 12 meters). The mountain is the national symbol of North Korea. Its pictures and references to it are widespread. 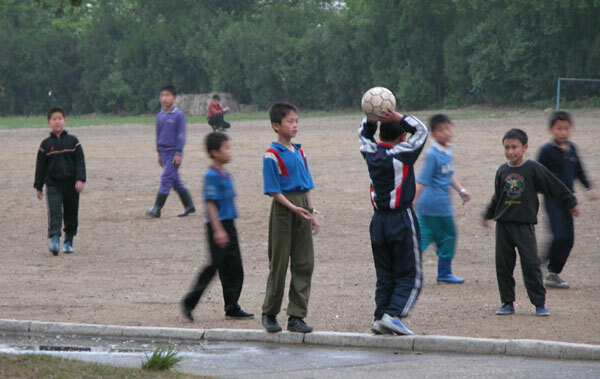 We haven't been there; it is about 400 kilometers from Pyongyang. Usually people take a plane there. The sculpture is put up in 1972. 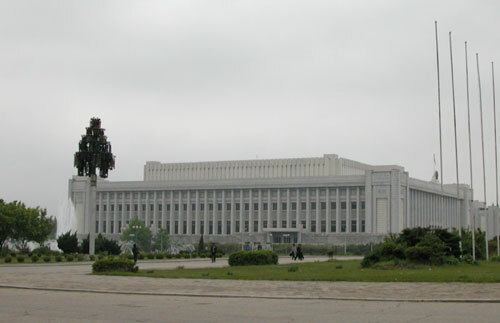 The building behind the statue houses the revolution museum (it was built the same year, but the museum has existed since 1948). 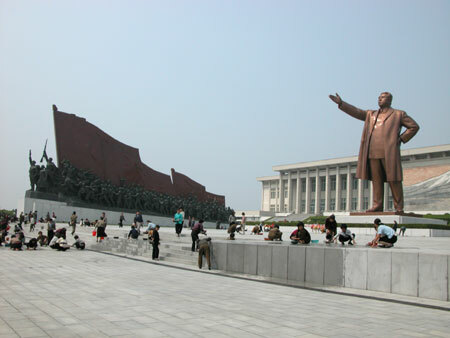 When people come to the square, they usually stop by the monument and bow reservedly. 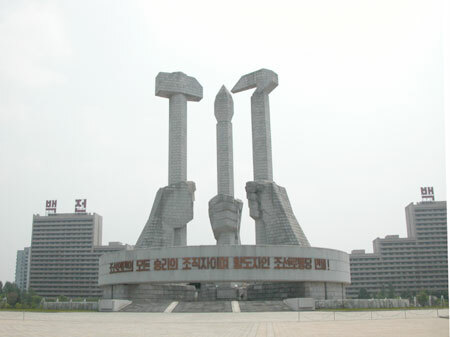 On both sides of the monument there are sculptures commemorating the revolutionary struggle of the Korean people. 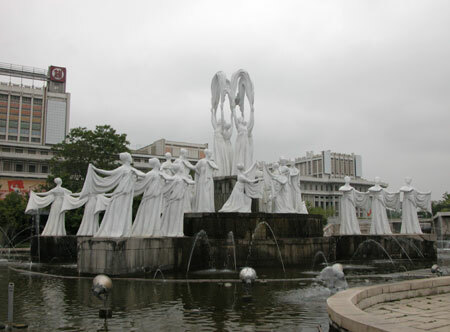 The same sculpture group viewed from the front. 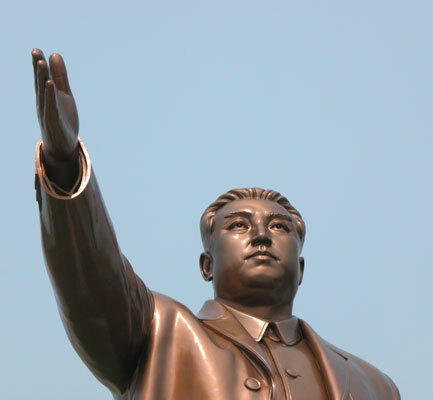 By the way this Kim Ir Sen monument is the only monument which is lit up all night long. This is quite telling, since everywhere else the electricity is used very sparingly. 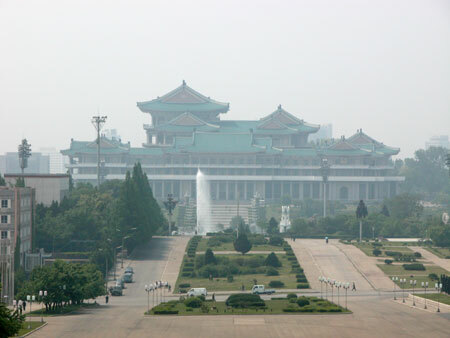 They try not to let that be a problem for tourists (we only had about three blackouts for a few seconds each, mostly in Pyongyang), but it is still very evident. For example the lighting on the second most significant monument - the monument to the Chuche Ideas (see the next album) is turned of strictly at ten PM. Outside the city all tunnels have lights in them, but they are never turned on. In other words there is a shortage of electricity here. If the atomic power station gets completed, it must get better. Some natural resources North Korea has are coal, gold, iron. I am not sure how plentiful they are. 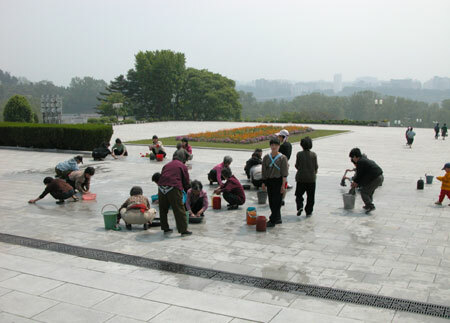 A street near Kim Ir Sen memorial. 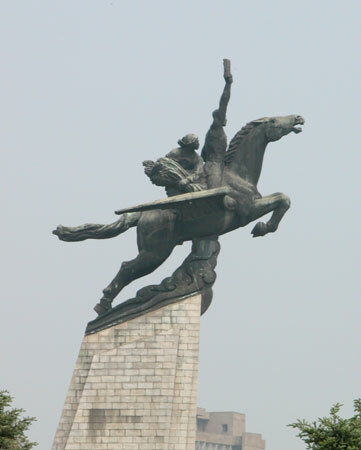 On the left is the legendary Chollima horse. The story is, there was a winged horse, and no one could tame him. However the horse really wanted to be tamed. :) Having found no hero on Earth, Chollima flew to the sky. 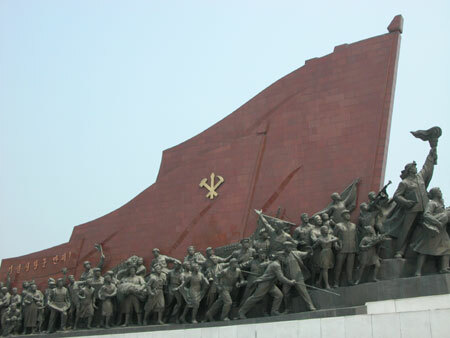 When everything had to be rebuilt after the war, a slogan was invented "Charge forward with the speed of Chollima!" The horseman is a worker with a Korean Workers Party address in his hand. A woman with rice in her hands is sitting behind dim.When everything had to be rebuilt after the war, a slogan was invented "Charge forward with the speed of Chollima!" The horseman is a worker with a Korean Workers Party address in his hand. A woman with rice in her hands is sitting behind dim. The monument was erected in 1961. Its height is 46 meters. A view from the monument on the other side. 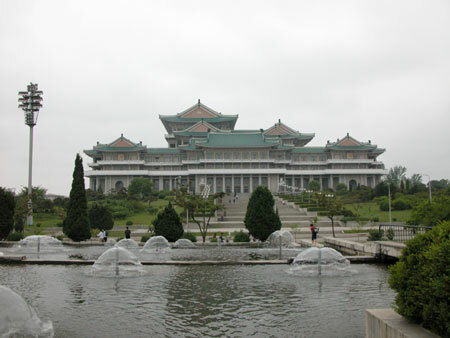 The Peoples Schooling Palace on the Mansan hill. 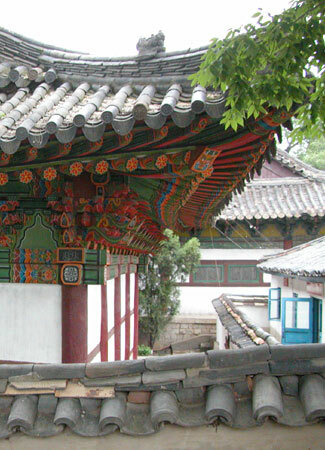 The building looks traditional, even though it was constructed in 1982. 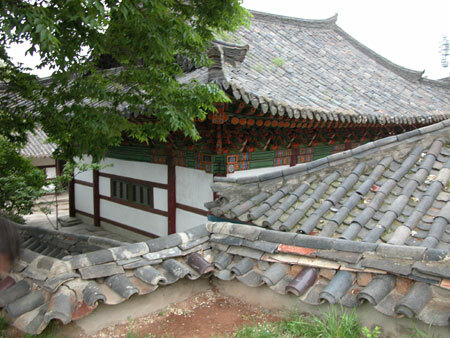 This approach (traditional national architecture and use of modern building material) is used here from time to time. In the following albums you will see a couple such buildings. 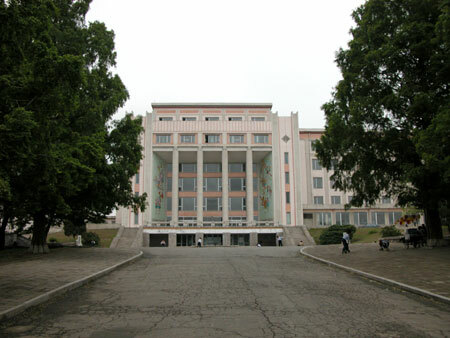 The Schooling palace has a book depository, many study rooms and auditoriums. The total area of the building is 100 square meters. It can fit 12,000 readers a day. The view from the opposite side. 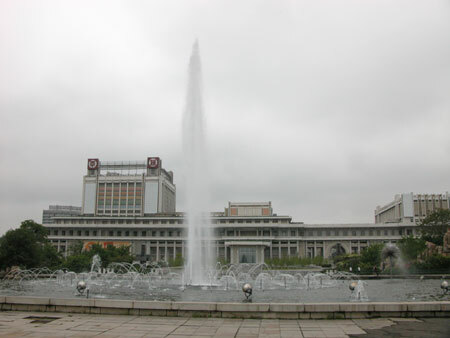 This picture and the next are two buildings on each side of the square in front of the Schooling Palace. 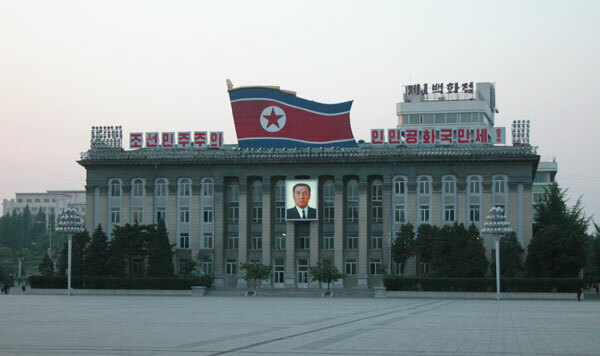 Here we can see the DPRK flag, and a portrait of Kim Il Sung. 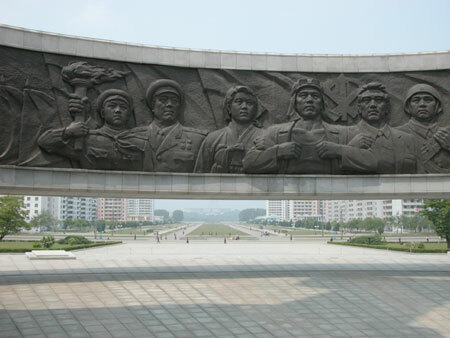 Here, at the top are the symbols of Korean Workers Party, on the right and left are portraits of Marx and Lenin. What's interesting is that portraits of Engels are not at all as popular in North Korea as they were in the USSR. For instance, I have seen silhouettes of Marx and Lenin next to each other. In the USSR the three silhouettes were always depicted together. I wander if there is a specific reason for that, or Engels just isn't considered a significant figure here. I must note there is only a single candidate at every election here. In other words, as in the USSR, real elections happen before the official ones by way of agreements among groups of statesmen. At official elections the people simply confirm the selected person. Another wedding - right next to the fountains. Again the Mansude Art Theatre building. A small hill next to it. The roller sakes are of the old kind - two pairs of wheels one after another. The girls said that there is no other kind. Having discussed this with Alexey, we came to the conclusion that, since the state does all the importing, the cheapest kind was probably selected. 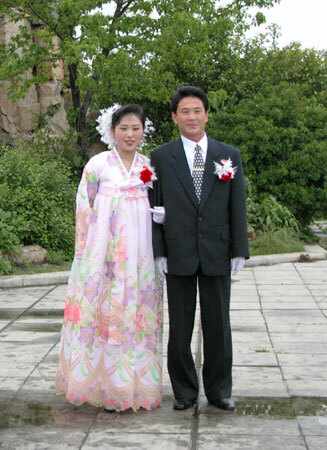 I remember an interesting detail - a watch is considered a valuable possession in North Korea. For instance, it is a common wedding gift. Near there is also an old Buddhist temple. Right now it is closed for an unknown period of time. The travel guide says that "churches … are open from 10 AM every Sunday". Though, if I am not mistaken, Buddhism is a more liberal religion - it does not interfere with the affairs of the state anyway. Besides, considering a certain atmosphere of holiness surrounding heads of state (much stronger than was created in the USSR around Lenin and Stalin), I suppose the citizens of North Korea have enough to believe in. 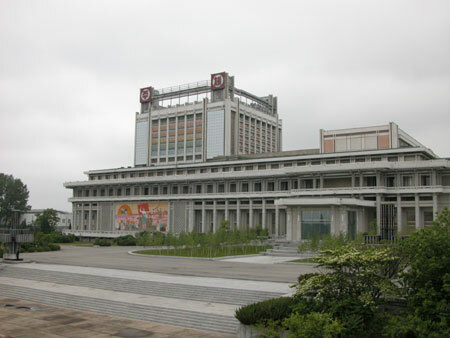 In addition, there is a Protestant church in Pyongyang (of modern architecture style) and, some say there is even an Orthodox church being constructed. The construction started after the visit by Kim Chen Ir to our Far East. In the next album I plan to talk about the monument of Chuche Ideas and some streets and buildings.